Today we are featuring Rosco Schock. By day Rosco is a software engineer who makes mobile apps and websites. He went to Penn State University and is joining us from Lancaster, PA. In his free time Rosco likes to read, kayak, camp and watch baseball. I had the pleasure of meeting Rosco at Metatopia in November and playing one of his games. Inviting him to join us at Granite Game Summit after that was a no-brainer. Questions by Kimberly Revia (KR), answers by Rosco Schock (RS). KR: Is there any mechanism you haven't used in a game yet that you would love to? RS: I'm really excited to use the "I split, you choose" mechanism. It is really under-used and adds instant agency and interesting decisions. I do have a design that I'm going to try it in and see what happens. KR: Which games inspire you? RS: Probably not one game in particular but designs by Feld and Knizia are really influential. Simple twists like only scoring your worst category or having point salad scoring where you can't really optimize all of them create a lot of tension while still leaving lots of interaction and agency for the players. KR: What are the steps you go through when designing a game? Is there a basic order of operations you use? RS: Usually I start with a mechanism or theme and try to find the other. Once I find a pair that matches and feels good together, then I'll move on to game play or a sample turn or some basic rules. Now that I have a model of the game in my head, I'll iterate on that until I think I have some interesting pieces. 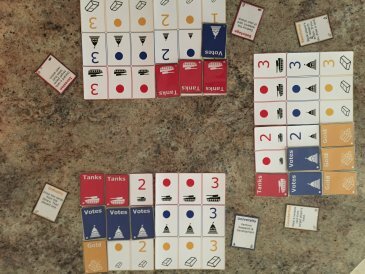 Then it is on to prototypes and play testing and then iterating from there. KR: What does your convention schedule look like for 2019? KR: Is there any theme you feel hasn't gotten enough love in modern board games? RS: Robots, there are very few and the ones that do exist are usually robots fighting. It would be cool to see a game about designing or building robots more in the "I, Robot" style. KR: Which game do you think you have played the most? RS: Without a doubt, Carcassonne (2 player). I've probably played 2000+ games digitally. You can find Rosco and see what he is up to by following the link below!